The Zazzo® Makeup FX DVD for Film and Television Makeup (70 minutes). With an emphasis on Airbrush Techniques for High-Definition, Bradley M. Look shares with you his Emmy Award-winning techniques and applications to create masterful makeup and special effects. Brad takes you behind the scenes of Hollywood makeup artistry to demonstrate not only beauty application using the airbrush, but also how to create alien characters. For the growing number of airbrush makeup artists, Brad has worked with Zazzo® to create this Makeup FX™ DVD along with Character Troupe™ and Beauty Ensemble™ airbrush templates. While a great deal of facial and body makeups are done using more traditional freehand airbrushing, this line of templates when combined with freehand, will allow you unlimited painitng effects! 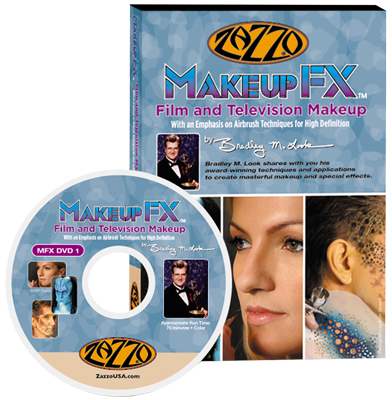 This 70 minute long DVD gives you an overview of the techniques, appliances and equipment to create makeup effects using Zazzo® Makeup FX™ Beauty Ensemble™ and Character Troupe™. Emmy-winning makeup artist for Star Trek: Voyager’s “Threshold,” has eight other Emmy nominations to his credit. He was also nominated for the Hollywood Makeup Guild Awards. Born in Peoria, Illinois, Brad now lives in Southern California, where he works in the entertainment industry. Besides being a Journeyman with the Makeup Artist and Hairstylists Union, Local 706, Brad has taught classes for UCLA and other national universities, as well as internationally on film and television makeup. He holds a Master’s Degree in Makeup from the College Conservatory of Music. Brad has been listed in the Who’s Who in Entertainment, and has worked on productions such as Flintstones: Viva Rock Vegas, A Woman Named Jackie, Deep Space Nine, Congo, Voyager, Star Trek: First Contact, Star Trek: Insurrection, Star Trek: Undiscovered Country and Enterprise, and many other Hollywood productions. Brad has written numerous articles on makeup, including co-writing the book, Star Trek: Aliens & Artifacts.